Head to Woodooz Home Decor located at Old Mahabalipuram Road for their handmade lamp shades. Look out for the shades with quirky prints on them. They also use different fabrics for their shades. Mridangam-shaped table lamp, equilateral triangle, cycles, and bandhini patterns, find lampshades of all sizes and designs at Woodooz Home Decor, located on Old Mahabalipuram Road. Woodooz is here to brighten up your home and life, literally. They have been around for a year and are experts in the manufacture and supply of fabric-based lampshades. All their products are handmade, one shade at a time, with lots of care and love. Awww much? They make what is called hard shades, where the hard backing sheets are mounted onto metal frames before wrapping them with fabric. They give us a major "Made In India" moment as all their fabric is sourced locally. They use raw silk, cotton, kalamkari, muslin cloth, and polyester for the shades, and will customise it based on your requirements. And here comes the best part, prices start at INR 250! Table lamps, floor lamps, wall sconce fixtures, hangings, and pendant lamps, they deal with all of this. The table lamps are a hit among the customers. They also have a photo lampshade made with the photographs that you provide. One for the memories, maybe? 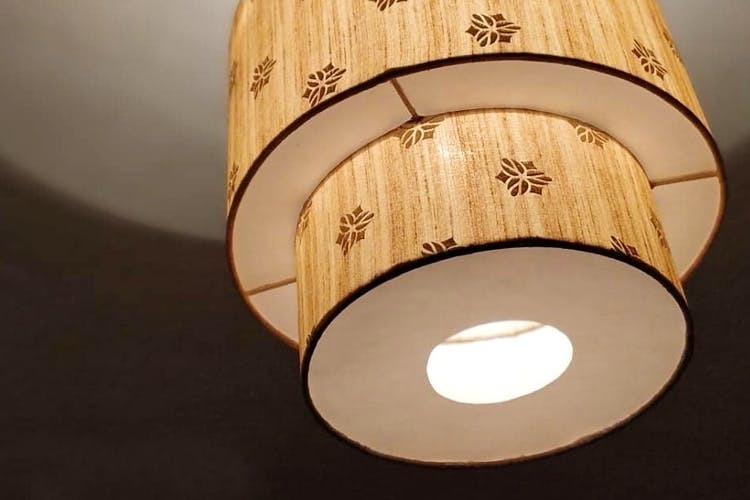 They can also restore the old, damaged lamp shade you have at home.